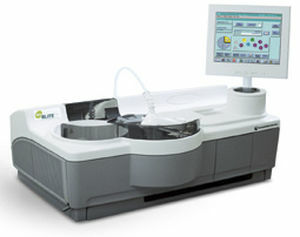 CL Analyzer: Semi automated system. Coagulometric, chromogenic and immunological assays. Easy as you wish, small as you need, ready when you are. Routine tests (PT, APTT) & special tests (D-Dimer, Antithrombin). ACL ELITE PRO: For the medium-to-low-volume laboratory, provides clotting, chromogenic and immunological assays for routine and specialty testing. Random access processing for minimized turnaround time. STAT PT and APTT available in as little as 8 minutes. Barcoded reagents. Superior walk-away capacity for 40 samples and up to 260 onboard cuvettes. Comprehensive test menu makes specialty testing as simple as routine testing. ACL TOP FAMILY: The ACL TOP Family is a complete line of Hemostasis Testing Systems- each designed with the same high standards of operation and functionality to meet the needs of your hospital and lab regardless of its size or scope. Whether running routine or highly specialized assays, ACL TOP provides Testing Process Automation in a range of instruments, ideal for low-to high-volume labs through fully integrated Laboratory Automation Systems. All ACL TOP Systems provide: same results – standardization among labs, same reagents and consumables – optimized administration, same features and usability – simplified training, same powerful and intuitive software –easy to use. 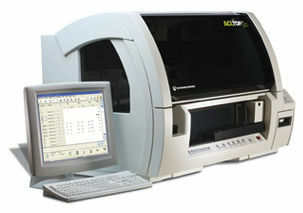 -ACL TOP 300 CTS: Newest and smallest ACL TOP analyzer for routine or specialty assays in low- to medium-volume labs. Throughput 110 PT/hour, 40 samples onboard, 26 reagents onboard. -ACL TOP 500 CTS: Highly automated testing processes in routine, medium- to high-volume and specialty labs. Throughput 240 PT/hour, 80 samples onboard, 40 reagents onboard. 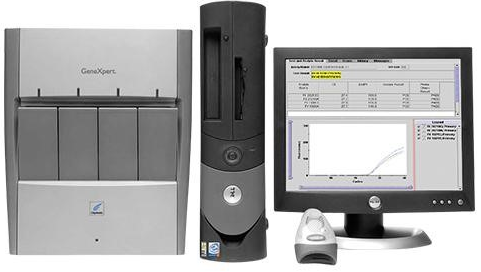 -ACL TOP 700: Run more tests in less time- user-friendly and high throughput for routine analysis in laboratories with the heaviest workloads. Throughput 360 PT/hour, 120 samples on board, 60 reagents onboard. -ACL TOP 700 CTS: Added safety in routine, high-volume and specialty labs with Closed-Tube Sampling. Throughput 270 PT/hour, 120 samples onboard, 60 reagents onboard. 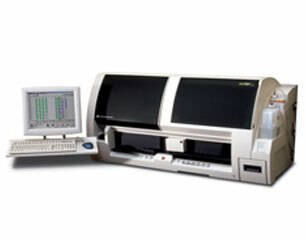 -ACL TOP 700 LAS: Maximum flexibility and efficiency, connects to your laboratory automation track. 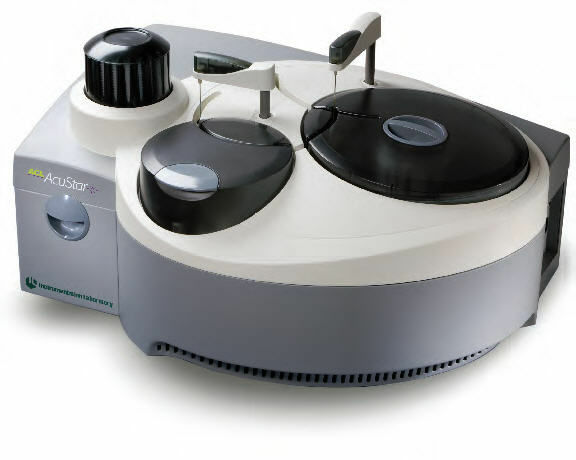 ACL ACUSTAR: The first instrument to introduce chemiluminescent technology in hemostasis testing. Developed specifically for hemostasis specialty testing, the unique characteristics, in combination with innovative assays, significantly improve testing accuracy, assay range, sensitivity, and specificity, while saving valuable time. 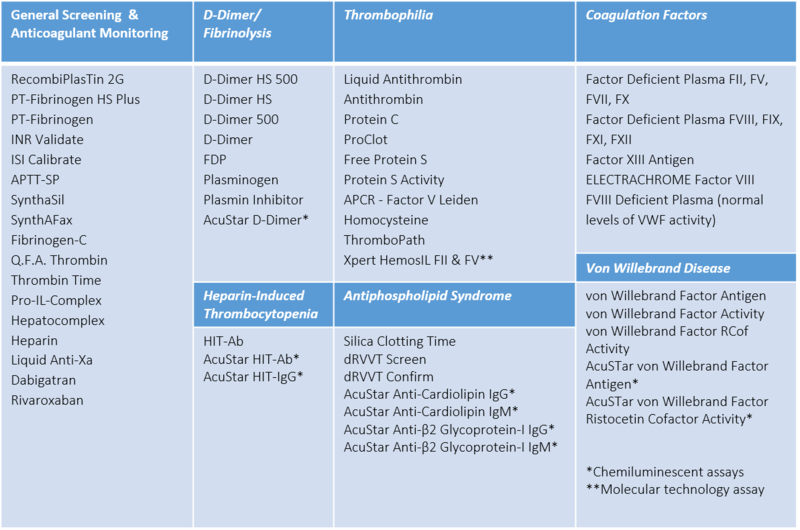 Complete test panel: D-Dimer, Antiphospholipid panel, HIT panel, VWD panel. Simple to use, fast and efficient, highly accurate and reliable. GeneXpert Dx System: Self-contained, fully integrated, real-time PCR offers efficiency for the lab and enhances service to physicians and patients. Simple, fast and cost-efficient. Combine Xpert HemosIL FII & FV on the GeneXpert with HemosIL assays on ACL TOP systems for a complete thrombophilia work-up on the same citrated sample.